Yamaha A-S500 review | What Hi-Fi? 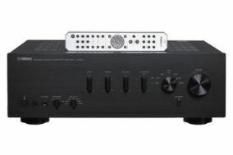 Yamaha isn't the first name to come to mind when the subject of budget stereo amplifiers comes up. It's not that the company can't do audio – a raft of five-star ratings for multichannel amps and the quality of the upmarket A-S2000 proves otherwise – but when it comes to budget, others such as Marantz, Rotel and Cambridge do it better. Up until now, that is. Yamaha went far further than most manufacturers and benchmarked this new amp against the very best at this price level. The result of all that work is a clear class leader. Its sound is strikingly clear, having little of the overtly smooth, slightly soft balance of Yamaha's pricier stereo units. Instead, we get a fast, rhythmically taut sound that's as exciting as it is informative. Used with well-behaved speakers and electronics – Monitor Audio's BX2s and Marantz's CD6003 CD player, say – the A-S500 shines. Its 85w per channel output generates decent scale, and the sound is agile enough to resolve a complex mix like Eminem's Not Afraid, while having the sophistication to make to make Beethoven's Moonlight Sonata sound like the slice of magic it is. Tonally the A-S500 is slightly bright, but in any sensibly chosen system this only contributes to the sense of sparkle. The phono stage is perfectly usable, though there are loses in transparency and dynamics. That said, the same can be said of those fitted to the competition, too. If you want a generously specified amp that you can plug in and forget, it's the 'S500. If you want the most entertaining sound at around £300 it should be your choice, too. Who'd have predicted that?